Well, nothing is good or bad but by comparison. With this article, we begin a set of articles in which we will compare Magento 2 extensions. Our comparison criteria: a set of features, price, number of reviews, price and support conditions, installation cost. Our comparison will be accompanied by a comparison table which is the best way to compare things. In the first article, we will consider Magento 2 PDF extensions, which are used to customize PDF invoices, as well as other PDF templates. Some really good extensions and useful articles are on bad positions in Google search, not getting the traffic they deserve. While useless pages can be found in the top 5 Google search. I believe that our articles will help many merchants and development agencies to make a right and informed choice, which is based on clear facts. As you know, Magento 2 uses Zend_PDF to generate PDF files. These templates are like a set of layers similar to layers in Photoshop. The native PDF Magento templates do not have any structured markup, it’s very hard to work with — it can take days or even weeks to customize native PDF templates. It will be much easier and faster (and therefore cheaper) to make templates by some module, that allows you to easily and quickly change fonts, colors, layout, add pictures and custom blocks with text. 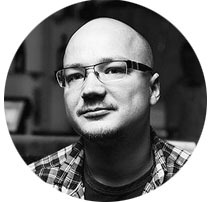 Such a module should ideally support HTML, which is very easy to work with. We developed this product about a year ago and we really are proud of it. This revolutionary product allows you to use HTML and CSS. It is very easy to work with, just as with a regular HTML document or email template. The module costs less than other good PDF extensions, while it comes with better support conditions and free installation. We constantly consider the feedback of our customers and improve our product accordingly. Unlike most of our competitors, our extension also allows you to add a product image and product attributes to PDF templates. You can see the full list of features on the product page. This PDF file was generated by PDF Customizer extension by PotatoCommerce. This module is on the 3rd position in Google search. However, I do not understand how this product has climbed so high. Judge for yourself — unlike the extension by PotatoCommerce, this module does not have HTML support, which does not give a full design control. You have to work with a limited set of options in the Fooman’s extension settings. In addition, it costs more than a module from PotatoCommerce. In addition, after a year your license for Fooman’s product will turn into a pumpkin because you can not get new versions of the module or receive any support — be prepared to fork out if you have a conflict with a 3rd-party plugin, or if you want to update the extension. Although this extension supports HTML, it’s a very weak product (see the comparative table). Cheapest is the dearest — despite the fact that this is the cheapest product in our review, the installation of the module is paid, and a free support is limited to only 3 months. (Potatocommerce offers unlimited free support and free installation). In addition, the demo of this product for some reason generates native PDF files, not customized. Does this module work at all, or is it a dummy? Looks like this product is abandoned. More than a year has passed since the initial release, and only 1 update of the product has been released. The weakest set of features among competitors. Paid installation, only 6 months of support included in the cost, and you will need to pay $120 for the year of support (more than the cost of the extension). This product aggressively occupied 4 positions in the first 10 positions of Google search, including the first two positions. This product has a good set of features, but the price is higher than PotatoCommerce, and you will have to pay an additional $50 for the installation, and the support is limited to 1 year. Despite the fact that this product is on the high 5th position in the Google search, this product is no longer available for sale. Okay Google, what the hell are you doing? This module does not support HTML, however, it uses MT Editor, which in theory allows making PDF templates without knowledge of HTML and CSS. I tried to use it on the demo, and it was not easy, I should say. It takes a long time to get used to the tool, it's a bit buggy, and I have doubts that this tool really makes life easier. Like Mageants, the Magetrend company offers a free support only for 3 months, and installation service is paid. As for the features, this extension does not support attaching PDF files to sales emails, it does not allow you to add product image and custom product attributes to PDF, as well as it does not allow to generate PDF for pending orders. In fact, this is yet another Mage-BlaBla company. 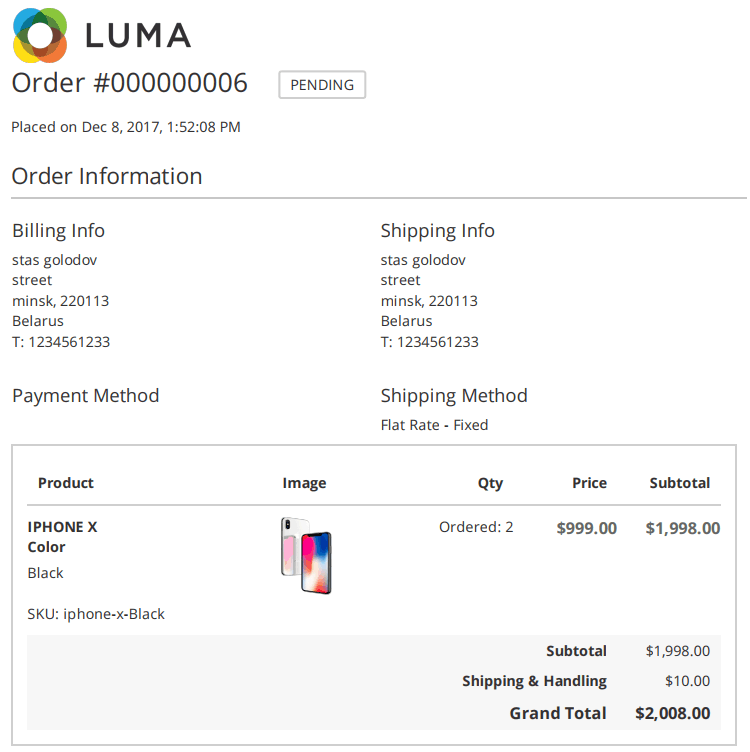 The price of the product is just as crazy as the product URL — $299. The demo does not work. And this is without any support! Stop the world, I want to get off! 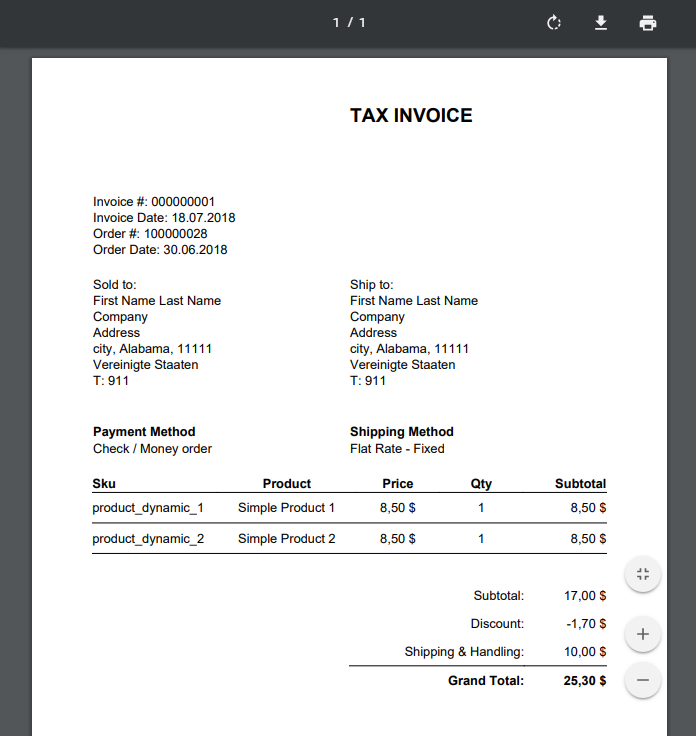 The set of features is not bad, but even for $299, you can not add the product image or custom product attributes to your custom PDF invoice. As you can see, PDF Customizer by PotatoCommerce wins the competition. 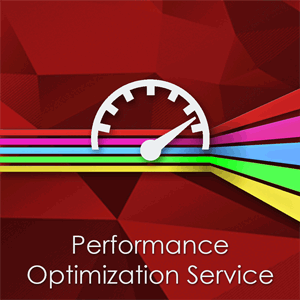 We offer the best support policy, as well as the best set of features.